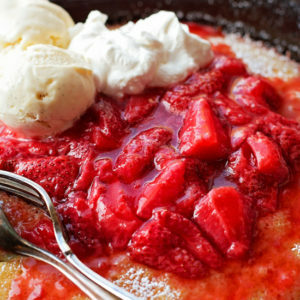 You’re going to fall in love with this sweet, buttery, strawberry shortcake skillet- I did! ???? Strawberry season is here!!! Are you as excited as I am?! Strawberries are one of my favorite fruits. I blame it on all of the patches I grew up by… I was seriously spoiled living in northern California. 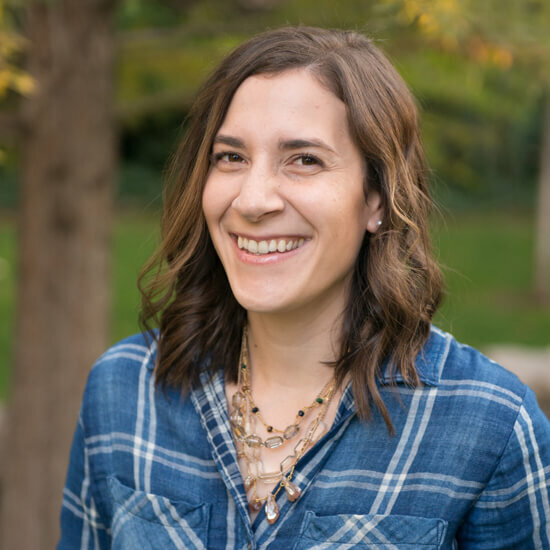 Now that we live in Utah we have to wait, and wait, and wait for the good ones to come to us. They’re finally starting to appear, which makes me ready for summer and all things strawberry. ???? 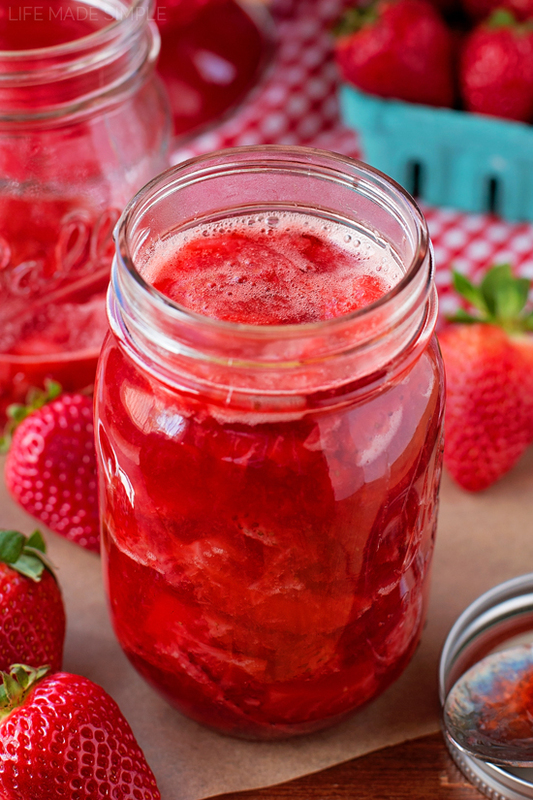 I wanted to share a quick and easy homemade strawberry sauce recipe with you today too. 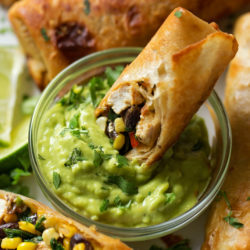 It only requires 5 ingredients and 10 minutes to make. I think it’s the perfect topping for this buttery skillet cake. 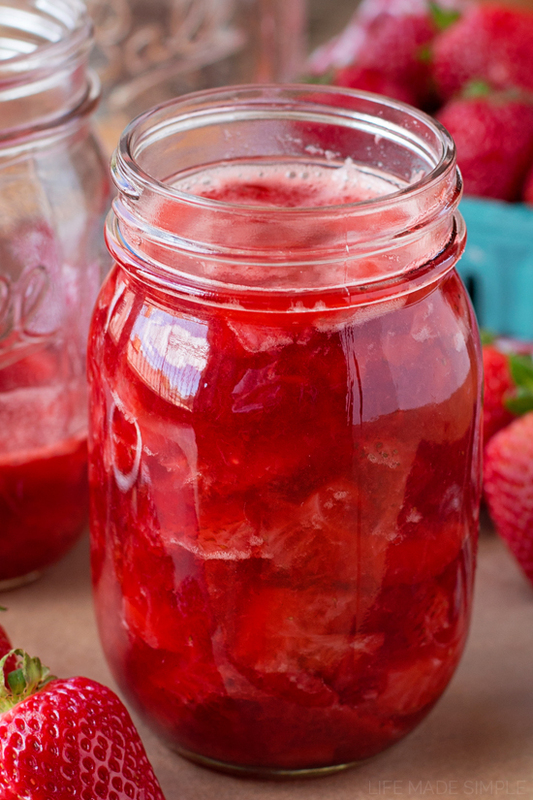 You’ll need about four cups of sliced fresh strawberries, 1/4 cup of sugar (less if you want it on the tart side), 1/4 cup of water, 2 tablespoons of lemon juice and 1/2 teaspoon of vanilla extract. Boil everything except for the vanilla until it gets nice and thick, then whisk the vanilla in at the end. That’s it. 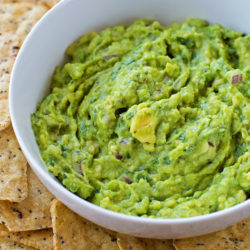 Soooo simple, yet so delicious. Not only is it great on cake, but it’s fantastic on top of homemade sundaes, in crepes, on pancakes or waffles or with granola and yogurt. But since we’re using it on top of this lovely yellow cake, let’s talk a little more about that. The cake is blonde version of a traditional (chocolate) Texas sheet cake… only done in a skillet!! 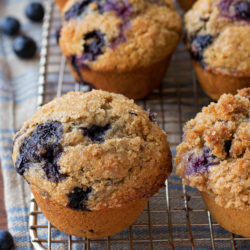 It’s super easy to make, the only special ingredient you’ll need is cake flour. I like to use cake flour with this recipe because it keeps it extra light and fluffy. I’ve made it without cake flour and found it to be a bit dense and crumbly. The type of flour you use really can make a huge difference. You’ll pour the hot batter into a prepared cast iron skillet and then bake it just until it’s set. 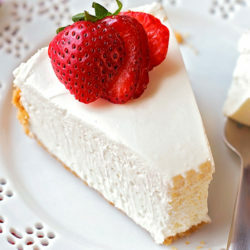 (NOTE: I like to make my strawberry sauce while the cake is baking so that it has a bit of time to thicken while the cake is cooling but still stays warm). 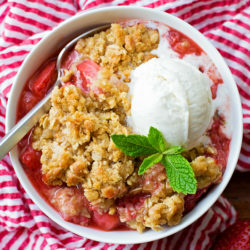 The only thing that’s left to do is pour the strawberries over top, add a few scoops of vanilla ice cream and a dollop or two of whipped cream and enjoy! And let me tell you, we did! 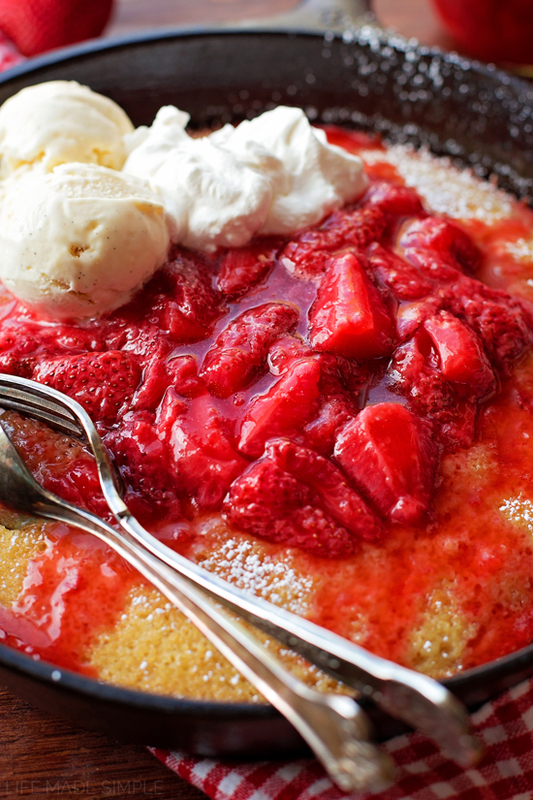 This strawberry shortcake skillet was a quick & easy recipe that our entire family loved. It’s something we’ll be making all summer long! 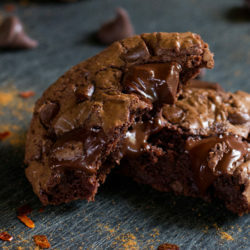 Enjoy & happy baking.???????? 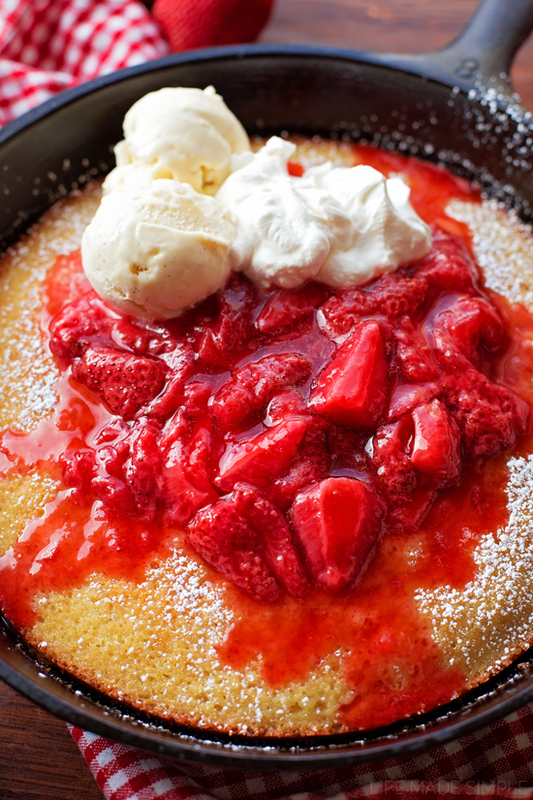 This sweet strawberry shortcake skillet is topped with homemade strawberries sauce! It's a favorite!! Preheat the oven to 375 degrees. 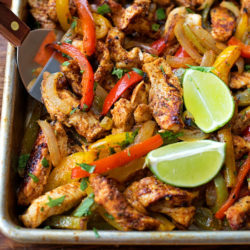 Lightly spray a large cast iron skillet with spray, set aside. In a medium saucepan set over medium heat, bring the butter and water to a boil. Meanwhile, in a large mixing bowl, whisk together the cake flour, sugar, baking soda, and salt before whisking in the egg, sour cream, vanilla extract, and almond extract. Remove the hot mixture from the heat, slowly pour into the dry ingredients, mix until combined (the batter will be extremely thin). Pour into the prepared skillet. Place in the oven and bake for 17-20 minutes or until the top springs back when touched. Remove from the oven. While the cake is baking, prepare the sauce. 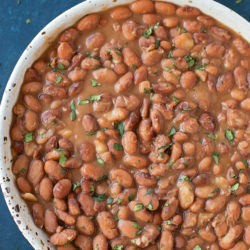 In a medium saucepan, bring everything except for the extract to a boil, reduce the heat and simmer until the sauce thickens, about 10 minutes. Remove from heat and stir in vanilla extract. To assemble, pour the warm sauce over the top of the cake, serve with a few scoops of vanilla ice cream or dollops of whipped cream. Enjoy warm. -You can easily customize the sauce, just swap out the strawberries for blueberries, raspberries or blackberries! White Chocolate Strawberry Brownies – Jamie Cooks It Up! Fresh Fruit Salsa with Cinnamon Tortilla Crisps – Jamie Cooks It Up! Strawberries and Cream Napoleons – Jamie Cooks It Up! 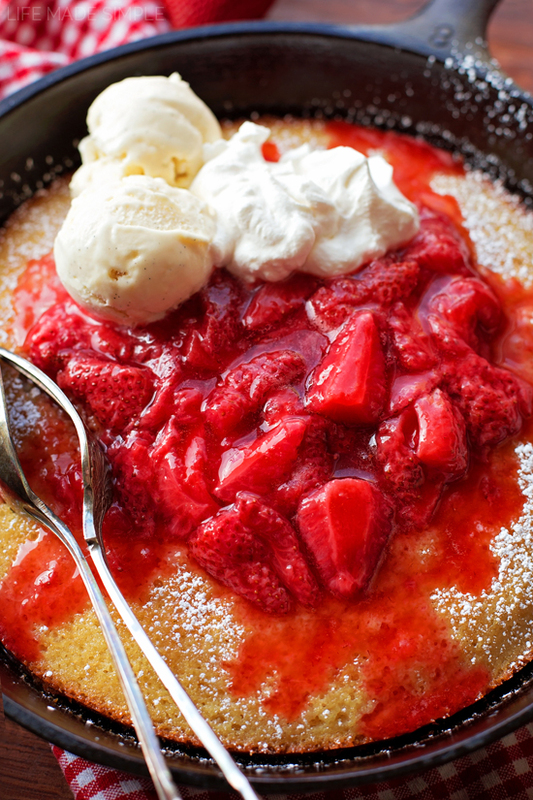 I have never actually made a skillet cake before, but this makes me want to try it. It looks sooo yummy, especially with that sauce!! 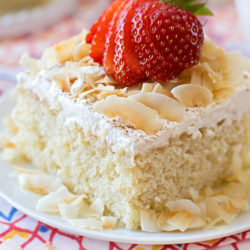 I love skillet desserts ts, but havent tried a cake. 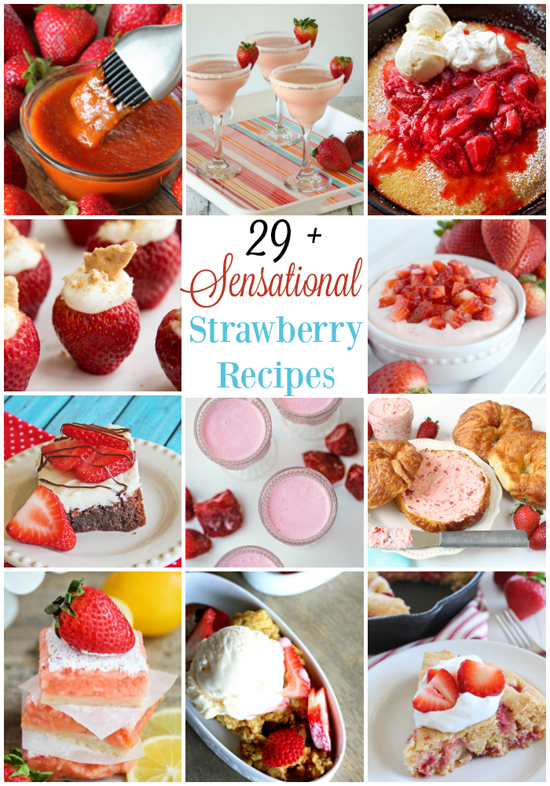 This looks amazing and especially that thick strawberry sauce. I want to put it on everything! How big is the large skillet? How many inches? Hi Leigh, great question. My skillet a 10.25″ in diameter, however, the recipe will work in a skillet up to 13″ in diameter. Just know that the bigger your skillet is, the less time it will take to bake. Hopefully that helps!